The New Jersey Supreme Court, in Mount Laurel I (1975) and Mount Laurel II (1983), declared that municipal land use regulations that prevent affordable housing opportunities for the poor are unconstitutional and ordered all New Jersey municipalities to plan, zone for, and take affirmative actions to provide realistic opportunities for their “fair share” of the region’s need for affordable housing for low and moderate-income people. Peter J. O’Connor, founder and Executive Director of Fair Share Housing Center, was one of three attorneys who brought the original Mount Laurel litigation. During the 1960s, two major development strategies were taking place in the Mount Laurel region, one in the City of Camden, and the other in its developing suburbs, including Mount Laurel Township in Burlington County. In Camden, the policy-makers were trying to utilize urban renewal and highway construction to rebuild the city. The result was just the opposite: the city’s middle-class residents, mostly white, left the city for the suburbs, and the poor, financially unable to move out, were displaced by the government action, “relocated” from one slum to the next and sentenced to reside in substandard, overpriced housing which became the worst urban ghetto in New Jersey. Their goal was to escape Camden to the decent housing, safe neighborhoods, good schools and employment in the developing suburbs. In Mount Laurel Township, mostly farmland located at the intersection of the New Jersey Turnpike and Interstate 295, adjacent to state highways Route 38, 70, and 73, the 1960s were a decade of major development plans, known as “Planned Unit Developments” (PUDs), which were intended to develop more than 10,000 homes, industrial parks and commercial centers and transform Mount Laurel from farmland to an affluent suburb; affordable housing, not even one unit, was not part of these planned developments. Mount Laurel’s plans were fiscal zoning at its best, aimed at attracting the highest tax rateables, which translated into excluding the poor. Contrasted with this massive development scheme was Mount Laurel’s historic black community, which had resided in the Township since the Revolutionary War, with many tracing their lineage to slaves from the South who escaped and came north by way of the Underground Railroad with Mount Laurel as a railroad stop and destination point. These black families worked the farms and were of modest means, incomes much below what would be needed to purchase one of the new single-family homes planned for Mount Laurel’s three PUDs. Mount Laurel’s longtime black community, facing the prospect of being forcibly removed from their community began to organize. While the PUD plans were undergoing the municipal approval process, Mount Laurel Township stepped up its code enforcement efforts in order to remove its black residents who were often residing in substandard, dilapidated housing, some of which were “living” in converted chicken coops. As these properties were condemned, the Township ordered the occupants to vacate. No relocation, as required by state law, was offered to these families. The goal was to get them out of the Township in order to enhance the PUD marketing plan to attract predominantly while middle-class and upper middle-class families and first-class commercial and industrial rateables. Mount Laurel’s longtime black community, facing the prospect of being forcibly removed from their community began to organize. Ethel R. Lawrence, a daycare teacher, wife, mother of nine, church leader and member of the Burlington County Community Action program (BCCAP, the anti-poverty program), organized an effort in November 1969 to petition Mount Laurel Township’s zoning board to permit the development by a nonprofit group of 36 affordable garden apartments. The objective was to create relocation housing within the Township for the black families who were being displaced and to provide permanent housing for her children, grandchildren, and Mount Laurel’s black community. The proposal was met with strenuous opposition from Mount Laurel Township officials. Represented by Carl S. Bisgaier, Kenneth E. Meiser and Peter J. O’Connor, Camden Regional Legal Service attorneys, Ethel Lawrence, potential displacees from Mount Laurel’s black community and the Southern Burlington County NAACP joined forces with the Camden County NAACP and black and Hispanic residents of the City of Camden to file class action litigation against Mount Laurel Township, its Planning Board, and Municipal Utility Authority to challenge the abuses of the local government powers which collectively utilized federal, state, and local funds to develop infrastructure which made development feasible in the Township and then used it planning and zoning power to exclude affordable housing opportunities in Mount Laurel Township for its resident poor and the poor in the region who desired to live in Mount Laurel. During 1970 and early 1971, the Legal Service attorneys, with volunteer support, researched and catalogued all of the federal and state support, including highway development and utility financing, which set the stage for Mount Laurel Township to develop. Additional study was conducted on how the Township was planning to use its financing and zoning powers to exclusively attract and benefit middle and upper income families. Finally, every mile of Mount Laurel was walked by scores of volunteers to map every substandard house and identify and interview the occupants. 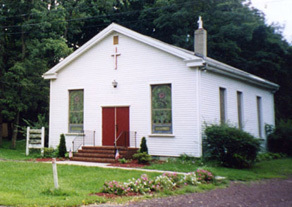 “If you people can’t afford to live in our town, then you’ll just have to leave…” With those words, in the fall of 1970 Bill Haines, Mayor of Mount Laurel Township, told a crowd of 60 African-American parishioners assembled at the Jacob’s Chapel A.M.E. Church that their application to build affordable garden apartments would be denied. The mayor stated that if you couldn’t afford to buy one of the new market-rate homes in the Planned Unit Developments (PUDs), you would just have to leave the Township. This meeting, similar to Rosa Parks refusing to give up her seat in the front of the bus, was the key event which triggered the grass-roots community effort, led by Ethel Lawrence, to challenge Mount Laurel’s decision, an effort which resulted in the landmark Mount Laurel New Jersey Supreme Court decisions, the Fair Housing Act and the opening of New Jersey’s suburbs to the poor. On May 1, 1971 (Law Day), Ethel R. Lawrence (who has been called the “Rosa Parks of affordable housing”) and the plaintiffs filed their landmark lawsuit against Mount Laurel Township. 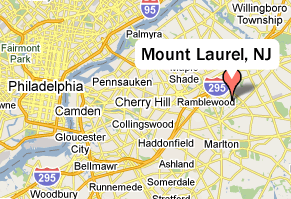 In 1972, the trial court ruled in favor of the Mount Laurel plaintiffs. The trial court opinion was the first breakthrough on the home rule powers of a New Jersey municipality which heretofore had been freely exercised to exclude the poor. The Court ordered Mount Laurel Township, within 90 days, to develop an affirmative plan to enable and encourage the satisfaction of the affordable housing needs of the resident poor and the needs of the regional poor, defined as moderate-income persons working in the Township and expected or projected to be employed in the Township. Mount Laurel Township appealed the trial court decision and never produced the plan required by the court. In March 1975, in Mount Laurel I, the New Jersey Supreme Court upheld the lower trial court decision, in the nation’s most sweeping and most often cited decision stopping towns from shutting out the poor through exclusionary zoning. The Court concluded that “every… municipality must, by its land use regulations, presumptively make realistically possible an appropriate variety and choice of housing. More specifically, presumptively it cannot foreclose the opportunity of the classes of people mentioned for low and moderate income housing and in its regulations must affirmatively afford that opportunity, at least to the extent of the municipality’s fair share of the present and prospective regional need therefore.” The U.S. Supreme Court refused a request by Mount Laurel Township to hear the case and overturn the New Jersey Supreme Court’s decision. When the decision came down Ms. Lawrence and many low- and moderate-income families throughout the state believed they would finally have opportunities for decent housing in towns with good schools and good jobs — towns where many of them had grown up but could no longer afford to live in due to exclusionary zoning. Between 1975 and 1983, most municipalities openly refused to implement Mount Laurel I.
Recognizing that the statewide public will did not exist to implement Mount Laurel I, that the political opposition was deeply entrenched and well-financed, and that the struggle had just begun, Peter J. O’Connor, a lead counsel in the Mount Laurel cases, along with other civil rights activists, in October 1975 founded the Fair Share Housing Center (FSHC), a 501 (c)(3) public interest law center to monitor, enforce and expand Mount Laurel I and subsequently Mount Laurel II. (1983) and the Fair Housing Act (1985). Between 1975 and 1983, most municipalities openly refused to implement Mount Laurel I. The New Jersey Supreme Court was accused by political leaders of violating the separation of powers clause. Local municipalities refused to yield their home rule powers. For several years, mayors and their counsel from more than 100 communities met monthly in Mount Laurel Township to develop strategies to undermine and overturn Mount Laurel I. During this period, the atmosphere supported the opposition platform that excluding the poor was synonymous with the exclusion of blacks and Hispanics. Newspaper cartoons supported this view. Mount Laurel Township, in response to the Mount Laurel I decision, re-zoned three tracts of land totally 20 acres out of 22.4 square miles (14,300 acres) for affordable housing. The first parcel was on land recently purchased for a transit stop in an industrial park; the second tract was filled with wetlands, at a considerable distance from public water and sewer, and the specific re-zoning contained many cost-generating factors that made development practically impossible; and, the third parcel was in the PUD development but its zoning barred children in one-bedroom units and severely limited the number of children in the two- and three-bedroom units. The plaintiffs argued that Mount Laurel’s response did not present a realistic housing opportunity for the Township’s “fair share” obligation. In July 1978, after 32 days of testimony, the trial court concluded that Mount Laurel Township’s re-zoning constituted a bona fide legislative compliance with Mount Laurel I. The plaintiffs appealed. Five years passed before the New Jersey Supreme court rendered its decision in Mount Laurel II. In 1983, responding to advocacy by attorneys for New Jersey’s Public Advocate (Carl S. Bisgaier, Kenneth E. Meiser and Linda R. Pancotto) and Fair Share Housing Center (Peter J. O’Connor) and other groups to address this widespread noncompliance, the New Jersey Supreme Court decided Mount Laurel II. The decision created specific requirements that every town in New Jersey must provide its “fair share” of the regional need for low- and moderate-income housing. Towns would have to provide a “realistic opportunity” for such housing—not just zone wetlands or an isolated location in an industrial park, but actually show how their zoning and other affirmative measures would lead to construction of such housing. Mount Laurel II also enhanced mechanisms that developers and public interest groups could use to ensure compliance by municipalities, such as the “builder’s remedy,” which allows a developer to bring litigation against a municipality to change zoning on a particular site if that developer demonstrates that the municipality is not in compliance with its Mount Laurel obligations and promises to include a 20 percent set-aside of low- and moderate-income housing as part of its development. The Mount Laurel “fair share housing” doctrine is widely regarded as the most significant civil rights case in the nation since Brown vs. Board of Education (1954). The decisions marked the first time in our nation’s history that a state Supreme Court has interpreted its constitution to prohibit economic discrimination in the exercise of state powers in land use regulation and to affirmatively require state and local governments to provide realistic affordable housing opportunities for the poor. Since 1985, as a result of Mount Laurel litigation, approximately 60,000 affordable housing units have been built in New Jersey’s suburbs, and many other states have adopted through legislative or court measures similar requirements. After Mount Laurel II, three trial court judges were specially appointed to handle Mount Laurel litigation throughout the state. Public interest advocates and developers filed lawsuits against many municipalities that had not done their fair share. The initial methodology for determining Mount Laurel need was developed in AMG Realty Co. v. Warren Township, which estimated a need of 16,153 low- and moderate-income homes per year statewide. In 1985, responding to an invitation from the Supreme Court in Mount Laurel II and growing pressure from municipalities to create a process by which municipalities could predictably meet their Mount Laurel obligations outside of the court system, the Legislature passed the Fair Housing Act of 1985.. The Fair Housing Act created the Council on Affordable Housing (COAH), a state agency which allowed municipalities to voluntarily devise a plan to comply with Mount Laurel and, by doing so, receive protection from further builder’s remedy lawsuits. The Fair Housing Act also created the now repealed Regional Contribution Agreement system in which wealthy towns could pay to get out of up to half of their obligation by funding the rehabilitation of housing in inner city neighborhoods. In 1986, the New Jersey Supreme Court upheld the FHA in Hills v. Twp. of Bernards. The Fair Housing Act provided for COAH to come up with municipal fair share numbers and acceptable compliance mechanisms every six years, giving rise to a series of “rounds” of compliance. For the Third Round, the six-year period was revised to be ten years. In 1986, COAH released the First Round rules (1987-1993), which required 10,849 low- and moderate-income homes per year statewide. In 1994, COAH released the Second Round rules (1993-1999), which required 6,465 low- and moderate-income homes per year statewide. The First and Second Round rules were generally upheld by courts against several legal challenges from municipalities and some from builders and public interest advocates. Advocates succeeded in 1993 in overturning one area of the rules, which allowed for a residency preference to limit the ability of people from outside of a town to move into Mount Laurel housing. 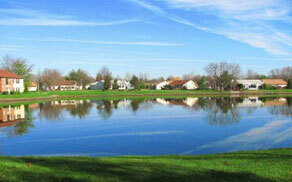 The Supreme Court in In re Warren found such a residency preference was inconsistent with the intent of Mount Laurel. Other important decisions relating to the First and Second Round include the Supreme Court decision in Fair Share Housing Center v. Cherry Hill making it clear that Mount Laurel strongly applies to redevelopment of previously unavailable land (in this case a racetrack to be redeveloped into a mixed-use development); the Supreme Court decision in Toll Brothers v. West Windsor upholding the builders’ remedy; and the Appellate Division decision in In re Southampton clarifying that a “realistic opportunity” requires careful analysis of each site proposed (in this case COAH had missed that a site was already developed with a shopping center). COAH was originally supposed to release the Third Round rules in 1999 but due to political pressure from municipalities failed to do so for several years, leading to litigation to force COAH to issue the rules. In 2002, the New Jersey Builders Association, and the Coalition on Affordable Housing and the Environment joined together to file a lawsuit challenging COAH’s extensions of municipality’s existing affordable housing plans — during a time of strong national and statewide economic growth that should have provided significant opportunities for new low- and moderate-income homes. In 2004, the Appellate Division ordered COAH to adopt the Third Round rules, calling the delay “dramatic and inexplicable.” At the same time, Fair Share Housing Center took a case to the New Jersey Supreme Court to force COAH to adopt new rules, which resulted in the Court giving COAH a window to adopt regulations but stating that it would review any further inaction by COAH if the deadline was not met. COAH then adopted new rules, but the agency cut the housing obligations of NJ’s municipalities in half—to 3,515 units per year—with many additional loopholes that would have had an even worse impact. Numerous municipalities that were supposed to have increased obligation miraculously received lower obligations. And the regulations left the keys to the doctrine to mayors. If wealthy suburban towns chose to grow, they would have to provide affordable housing. If they chose to exclude working families by not growing, that was OK too. A municipality’s fair share obligation - the essential underpinning of the Mount Laurel doctrine - would be determined by those with the greatest desire to exclude. The fox was regulating the hen house. Another flaw included a provision that permitted municipalities to restrict half of their units to seniors and transfer half of their obligation to a poor municipality, thus entirely excluding families with children. Three members of COAH’s Board called the rules unconstitutional and were then replaced by Governor James McGreevey. Once the rules were finalized, in 2005, an appeal was filed by Fair Share Housing Center, the New Jersey Builders Association, the Coalition on Affordable Housing and the Environment, and ISP Management Co., Inc. on the grounds that COAH’s rules were unconstitutional. On the other side, New Jersey State League of Municipalities and New Jersey Institute of Local Government Attorneys appeared as amici curiae in support of the regulations, those organizations gave any observer of local New Jersey politics reason to be suspicious. New Jersey mayors, with few exceptions, have opposed fair land use policies for decades. That the League, which in our view has always favored the interests of wealthy municipalities, would change course and actively support COAH’s policies said more than we could ever say about the flaws in the regulations. The Court’s decision jolted COAH, but further delay followed as COAH missed the July 25, 2007 deadline to adopt revised regulations set for it by the Appellate Division. COAH requested successive extensions, along the way proposing regulations that were plainly unconstitutional. After two more proposals, COAH’s complete Third Round regulations were finally adopted in October 20, 2008, close to two years after the Court rejected its first adoption of regulations as unconstitutional. Despite this extension, wealthy suburbs and their surrogates continued to work overtime during the Fall to try to get the deadline pushed back into 2009—fortunately, to no avail. Despite cries that “the sky is falling,” close to 300 municipalities quickly prepared fair share plans that are now being reviewed by COAH and in the courts. Governor Corzine signing the A-500 bill into law. Without a doubt, 2008 was a tremendous year for those in need of affordable housing, most notably due to the signing of A-500 at Ethel R. Lawrence Homes in Mount Laurel. This law guarantees housing opportunities to very low-income families (those making less than $23,000 a year) and prevents wealthy towns from transferring their affordable housing obligations to poor towns through Regional Contribution Agreements (RCAs), two changes that Fair Share Housing Center pursued for many years. The law was passed thanks to the strong leadership of Assembly Speaker Joseph J. Roberts, Jr. and Majority Leader Bonnie Watson-Coleman. 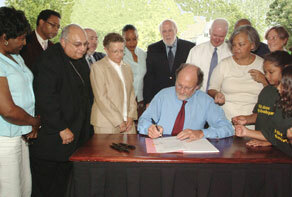 Governor Jon S. Corzine signed A-500 into law on July 17, 2008 during a ceremony at Fair Share Housing Development’s Ethel R. Lawrence Homes in upscale Mount Laurel Township. Some 400 people witnessed the signing of the bill, which has been hailed as the “most important housing reform legislation enacted in the nation in the last two decades.” To read more about this historic event, read our brochure (PDF).